This "Historically Speaking" column appeared in the Exeter News-Letter on Friday, August 18, 2017. For over a century the ice wagon was a common sight on Exeter’s streets. Hot summer months would find children excitedly skipping to meet the iceman in hopes that he would give them slivers of ice chipped from the huge blocks he delivered to nearly every house. Today, our huge American refrigerators are a focal point in our kitchens. Indeed, staring blankly into an open fridge is almost as common as staring at our phones. The whole idea of refrigeration, be it an icebox or electric refrigerator, is still a fairly new development. Food spoils in heat. Before the development of the home icebox, people would try to keep food cool by burying it in the ground, storing it in the cellar or floating it in a nearby stream. Farm wives even kept the butter cool by dangling it down the well. None of these methods worked well. Most foods, but particularly milk and dairy products, spoiled quickly in warm temperatures. This was the reason for high mortality rates during the summer months – particularly in children. Called ‘summer flux’ or ‘summer disease,’ deadly gastrointestinal ailments could quickly dehydrate a small child. Exeter’s 1832 Bill of Mortality, which listed causes of death, noted six cases of ‘cholera morbus’ – a catch-all phrase for deadly dysentery and diarrhea. Of those six cases, five were children under the age of four. In a town of only 3000 people, cholera morbus was responsible for nearly 14% of deaths that year. The only disease deadlier was tuberculosis, which killed 12 citizens. TB was also commonly transmitted through dairy products. The humble icebox changed little over the decades. An ice block of varying weights was placed in a compartment on the top and slowly allowed to melt, the water caught in a drip pan beneath the food shelves. Often it was a child’s chore to empty the drip pan. The icebox itself was either functional in appearance, or a fine piece of furniture. Sears and Roebuck advertised a basic model, in 1902, for only $5.94 made of ash all the way up to a luxury model “solid quarter sawed oak, white porcelain enameled steel lined” for large families or boarding houses. No matter the quality of the materials, all iceboxes suffered from mold and mildew. Still, in spite of its drawbacks, the CDC lists refrigeration and pasteurization as two of the great achievements in public health in the 20th century. The need for ice was tremendous. The Exeter Gazette noted, in 1889, that “Mr. Daniel Sanborn will soon put in the ice for Messrs C.C. and R.A. Littlefield at the Depot Café. It takes two hundred tons to supply what is needed at this Café in the summer.” Henriette Gallant, who moved to Pine Street in Exeter in 1902 as a child, recalled in an interview in 1976, “We had no refrigeration so some people kept their cold things in the basement, but other people would have the ice cart come around and they’d sell ice by the pound.” Leonard Smith, who lived on High Street as a boy, recently told his younger brother Peter that he remembered the family icebox stood in the dining room and was green. By the time Peter was born in the 1930s, the icebox was on its way out thanks to electricity. “Not until 1930 was the balance reversed with the sale of 850,000 mechanical refrigerators that year. By 1944 mechanicals outnumbered iceboxes by more than two to one” nation-wide, states Ierley. In Exeter, the ratio was most likely smaller. 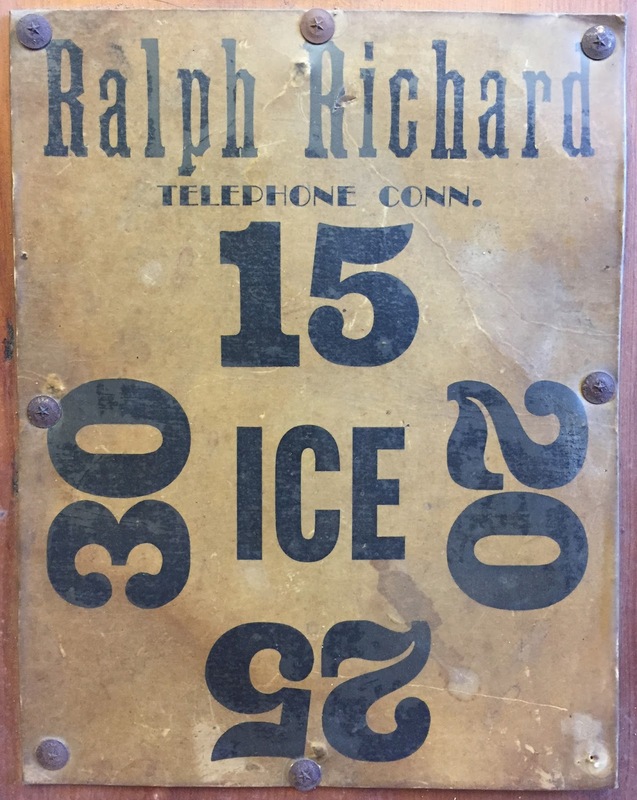 Gerard Richard, one of the last ice merchants in Exeter, told Nancy Merrill in 1986 that most people in town still had an icebox in the 1940s. During the war most people couldn’t purchase refrigerators and after the war people didn’t have the money. Clever salesmen, however, looked for the ice cards customers placed in their windows to order ice and easily identified those who needed a sales pitch for the new electric refrigerators. The ice wagon – now an ice truck – continued to make deliveries into the 1950s. 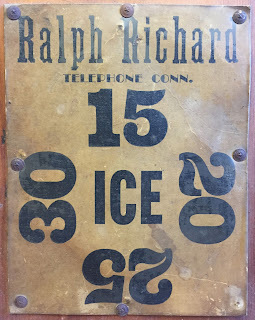 Richard still delivered chipped ice to the drugstores, Phillips Exeter Academy and Exeter Hospital. Late that decade, however, he said he “woke up and business was not there.” Old iceboxes were relegated to the barn or hunting camp. The days of the iceman had passed. Image: An ice card from the late 1940s. Customers would place the card in the front window and rotate it to indicate the number of pounds of ice needed. In the 1950s, use of an ice card easily identified icebox owners to salesmen eager to sell new electric refrigerators.